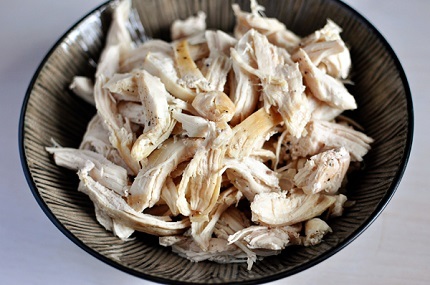 Keeping cooked, shredded chicken on hand is crucial to making dinner night a pleasure and not a pain. There are tons and tons of recipes out there that call for cooked chicken and I’m going to share with you my latest favorite method for getting tender, delicious cooked chicken without a) buying a rotisserie chicken and b) having to plan ahead. Frequently, if I have happened to plan ahead, I’ll throw chicken breasts in the slow cooker with low-sodium chicken broth and some simple seasonings and let it cook on low for 4-5 hours until the chicken breasts are just cooked through (too long in the crockpot and they’ll be dry). After the chicken has been shredded and cooled, I will freeze the chicken to use for later. However, I don’t always think to plan ahead and so when I came across this latest method from America’s Test Kitchen, I knew it would be a lifechanger. And it has been. I’ve used this method at least 5-6 times in the past two weeks and I love the result. The chicken is moist and flavorful and I can have cooked, shredded chicken for a recipe in less than 15-20 minutes (plus, you can increase the proportions and freeze to use later). To be perfectly honest, I like the finished product of this chicken much more than the crockpot method. It has more flavor and is juicy and delicious. It’s my new go-to. Place the chicken top-side down in the hot skillet and let the chicken cook for 5 minutes until golden brown on top. Flip the chicken, add the water or chicken broth, cover the skillet and let the chicken simmer gently over medium heat for 7-10 minutes until the chicken is cooked through (it will register 160 degrees on a thermometer). Don't overcook or it might be dry. While the chicken is simmering, add additional water 1/4 cup at a time if the liquid evaporates too quickly. Remove the chicken from the skillet. Let it cool slightly before shredding. The cooked chicken will keep well-covered in the refrigerator for up to 3 days or can be frozen for up to 2 months.